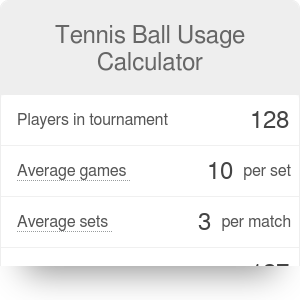 Let's calculate how many tennis balls are used during a professional tennis tournament. A lot of tennis balls are used during professional tennis tournaments. Grand Slams, that involve several hundreds of players, account for tens of thousands balls that never return to the professional tennis again. According to ATP and WTA standards a new set of 6 balls is being put into the game after the first 7 games of any given match and then every next 9 games they're replaced with another 6 balls. For a simple 6-0, 6-0 sweep in Women's tournament only 16 balls will be used. At the same time, if 2 Men's tournament participants go into 5-sets clash with 12 games on average in each set, 36 balls will be used. On top of those numbers hundreds of balls "magically" disappear after landing in the crowds. Who after all doesn't want to have that kind of souvenir? Keep in mind that a lot of events happen during each Grand Slam tournament which account for countless of balls used. Those are most popular single and doubles for both Men and Women. Also mixed couples play the tournament, along with juniors, disabled players as well as plenty of participants of invitation tournaments. Tennis Balls can be embedded on your website to enrich the content you wrote and make it easier for your visitors to understand your message.